President Joe & Wendy Karabensh greet guests as they find their seats at the Fort Pierce Banquet. On Friday, November 9, Missionary Flights International (MFI) hosted the Hangar Banquet at it’s headquarters in Fort Pierce, Florida. With an anticipated 630 people attending, it is estimated that there were just over 600 who came out for an evening titled, “Moments of Impact.” This banquet highlighted various areas that Missionary Flights has influenced over the last year. Catered by TooJay’s in Vero Beach, the cuisine for the evening included baked Alaskan salmon, stuffed chicken breast, pot roast, green beans, roasted potatoes, carrots, and chocolate cake. Guests had the pleasure of finishing the evening with a cup of coffee as they were encouraged to consider MFI in their end of the year contributions. As with every MFI event, special care is given to praise the Lord for his great work. Worship was led by Ray, Amy, and Ashley Lloyd. Familiar songs such as “How Great is Our God,” “How Great Thou Art,” and, MFI theme song, “I’ll Fly Away,” were some of the titles of choice. “Standing in the Gap” continues to be the motto of MFI. Videos throughout the evening included “Goats to Haiti,” “Christmas Bags for Haiti,” and “Propel DR and Missionary Flights Partnership.” Each of these videos can be found, downloaded, and easily shared at vimeo.com/missionaryflights. Kevin Stratton is joined by Karen Davis on stage for a missionary interview during the Fort Pierce Banquet. Davis: “That started about 6 months after we moved to Haiti. We were at the airport one day, and I ended up helping MFI with their paperwork for the government. Then I began to help with the passengers. Then, the cargo. Finally, my husband and I looked up and realized that we were the volunteers for MFI in Haiti. Stratton: “I’ve been a Pilot at MFI for 8 years. When Karen says volunteers for MFI in Haiti, she means that every time we land in Cap-Haitian she is there to meet the flight. She is there to handle passengers and cargo. It is really hard to explain all of the various things Karen does and what she means to MFI. Karen interacts with the 120+ affiliated mission organizations that are connected to Cap-Haitian. I would like for her to share a story of how she has seen an impact in relation to some of those other missions. 2018 Volunteer of the Year shows how to clean the sewage compartment on the plane. 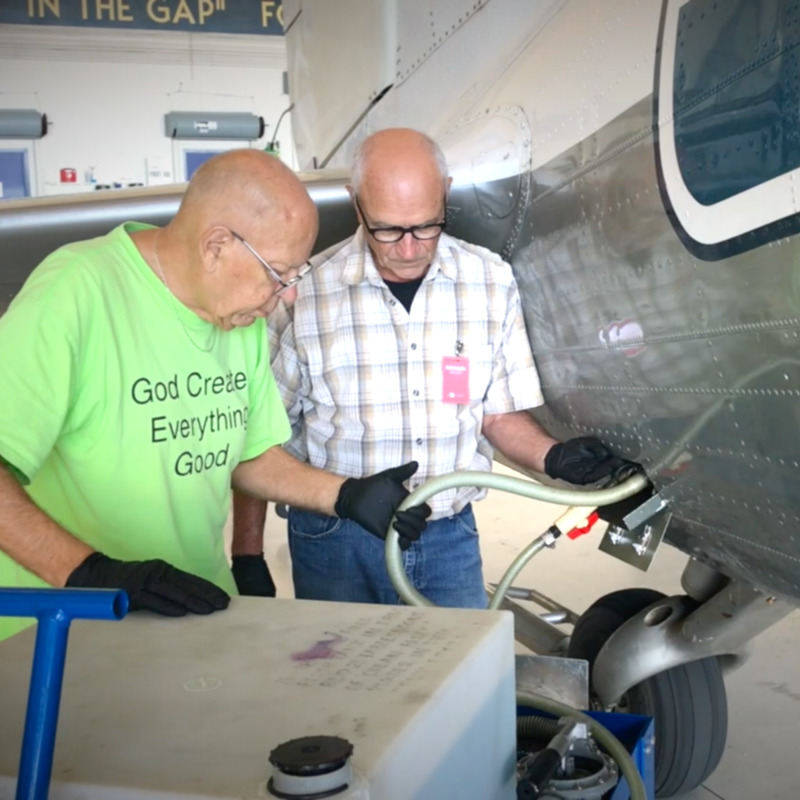 Since 2014, Missionary Flights has been recognizing volunteers for their service in memory of George Knoop. Knoop served as a volunteer in Haiti for a few years before he was killed in May 2014. While the award recognizes a single person or couples commitment to serving the Lord, all volunteers are celebrated in their collective effort to help MFI stand in the gap. The 2018 George Knoop Volunteer of the Year was Pitt Gallup. He is known at MFI as the man who cleans out the sewage compartments on the planes. Gallup shared that his secret to success in this area of service is that he has no sense of smell. He reminded those in attendance at the banquet that physical limitations are small in the eyes of the Lord, and that he can use any who are willing. If you have not heard by now, MFI flew its newest airplane home from South Africa in May of 2017. That airplane is still under heavy renovations and will be for the foreseeable future. A significant amount of the aluminum skin needs to be replaced. The interior needs replacing. A galley and restroom need to be fabricated. The list is long and the availability of labor is light. The website shows some of the latest news and progress at missionaryflights.org/N300MF. If you are a willing and capable aircraft mechanic, please send us an email and we will put you to work. Caleb Lucien unloads tents from a pickup truck in Haiti. A report was given on the 5.9 earthquake that struck just northwest of Port-de-Paix, Haiti, on October 8, 2018. According to Associated Press and the U.N. Office, the disaster resulted in a death toll of 18 people and those injured at 548. Caleb Lucien, founder of Hosean International Ministries, sent MFI a picture of tents being used to meet immediate needs. MFI purchased one-hundred family canopy tents to assist those whose homes were destroyed. According to the U.N. Office, there were 2,102 homes destroyed and 15,932 homes damaged. On October 20, those tents were flown to Haiti and made their way to trusted partners in the quake area. Additionally, MFI donated $10,000 to assist with medical needs. Bruce Robinson with Crossworld was not surprised by the lack of news coverage. While most of the buildings along the road looked fine, there was a house near him where a 300 pound concrete beam landed on the bed where someone was resting when the earthquake hit. That person was sent to the hospital. This story, along with other stories of injury and panic, filled an update sent out by Robinson. This event truly was a reminder to many of the chaos and destruction seen in the Port-au-Prince earthquake of 2010. Robinson emailed MFI requesting 40 tarps. While acquiring tents for Lucien, MFI contacted Robinson and it was determined he needed 12 family canopy tents also. Drainage pipes lay on the Hospitality Park property, waiting to be placed. MFI President, Joe Karabensh, shared that Phase 1 of the Hospitality Park is a $1 million portion of the estimated $4 million project. Phase 1 was fully funded at the close of 2017 and began to see paperwork approved and progress made in 2018. Contractors conducted a tree, soil, drainage, and gopher tortoise survey. The property needed to be rezoned from light industrial to RV park. Problems with a sewage connection were soon found. On the west side of Hammond road, all units are required to connect to Fort Pierce Utilities with the closest connection on St. Lucie Blvd, a cost of about $100,000 to run the pipes. However, the Lord was faithful to provide, MFI was given approval to cross the street and connect to the county system at the airport. All other Phase 1 plans have been approved. A groundbreaking ceremony for the Hospitality Park was held on August 15, 2018. Since then, about half of the trees on the property have been removed. Many of the beautiful oak trees have been preserved throughout the property. The trees removed were converted to mulch and then removed from the property. The mulching of the trees helped to stretch and save funds within Phase 1 of the project. Digging on the property began in October 2018, and underground water was pumped to the far west detention pond. After digging a trench, the sewer pipes were laid. 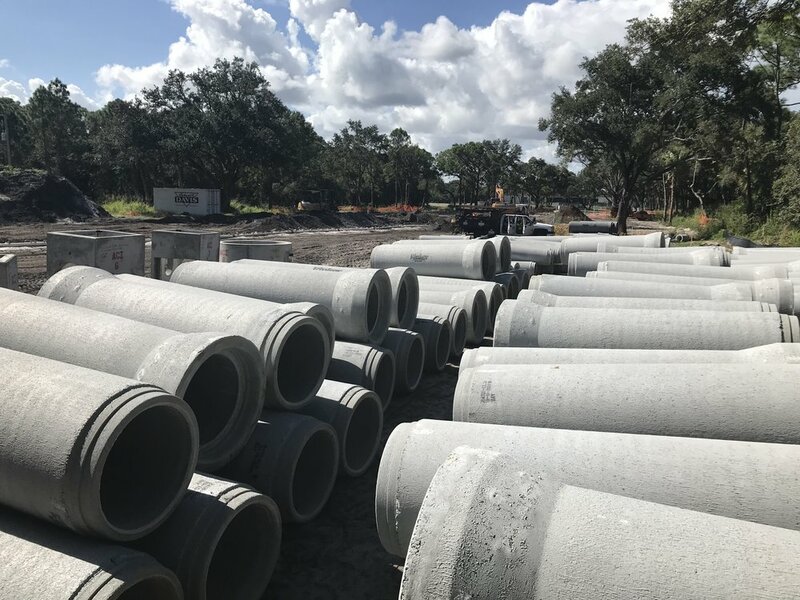 As of November 2018, storm drain pipes, waiting to be laid, line the property. Once placed, drinking water pipes and electrical conduit for the RV lot and the buildings will be run. An artistic rendering of the Hospitality Park at Missionary Flights. This year Missionary Flights is nearing the goal of a $1 million match. The fundraiser for Phase 2 of the Hospitality Park stands just over $815,000. MFI is just $185,000 shy of achieving its goal. If they can meet this year’s match before the end of the year, the generous donors agreed to offer another $500,000 match for 2019, which will be for the 3rd and final phase of the project. Please consider how the Lord may direct you to give toward the Phase 2 fundraising efforts. Many who have already given were encouraged by friends and family to do so. Others who heard of the matching opportunity decided to double their initial gift. MFI knows that, for the Lord, the final amount is very little, and so they are asking all MFI supporters to pray earnestly for the final goal. For more information on Missionary Flights International or how to become an affiliated mission, volunteer, or donor, please call 772-462-2395. Missionary Flights International (MFI) is a 501(c)3 non-profit organization located in Ft. Pierce, FL, at the Treasure Coast International Airport. We transport affiliated missionaries, supplies, and hope to the people of Haiti, Dominican Republic and the Bahamas. We serve as a loving and dependable link between those who serve on the front line and those who support them with prayers and donations. Tables were decorated with flowers by Something Special in Vero Beach, FL.